especially if the choice is to purchase a package or nuc, since availability is often limited and orders must be placed during the winter or early spring. Buying a full size, existing hive, which may contain 40,000 bees or more, requires active management from day one – a task for which most new beekeepers are not prepared, and one which can quickly become overwhelming. Better to start with a package of bees or with a nuc, both of which contain fewer bees – about 12,000 each. That way the new beekeeper’s skills and knowledge can develop as the new hive grows in population. Starting a hive with package bees is starting from scratch. Package bees are shaken from frames of hives, usually by commercial beekeepers in the southern U.S., into a shipping box – the package. A queen in a protective cage is placed inside, and the package is ready for sale or shipping. 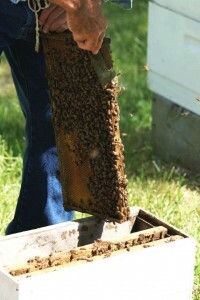 The beekeeper receives the package and installs both bees and queen in a new hive containing only frames and foundation. Once in their new home, the bees free the queen from her cage by eating through a sugar candy plug. If all goes well, the queen begins laying eggs as soon as the bees have drawn out enough comb and, about three weeks later, new bees begin to emerge and the colony gradually builds up. 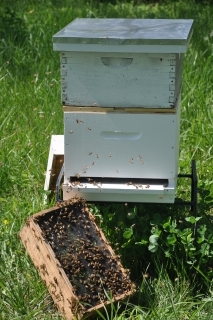 A nuc (short for nucleus hive) can be thought of as a starter hive, smaller in size and with fewer frames and bees than an established colony, but complete with all the elements of a hive. A nuc is created when an experienced beekeeper removes several frames – along with bees, stored honey, pollen, eggs and developing bees (called brood) from a strong hive and places them, along with a queen, in a box half the size of a regular hive body. He or she should maintain the nuc for a short time – usually two or three weeks before offering it for sale – to ensure that the queen is laying and that the nuc is off to a good start. The new beekeeper transfers the frames and bees to an empty hive where, under his or her care, it will grow into a full size colony in a couple of months. There are advantages and disadvantages to both. In purchasing a package, a new beekeeper does not have to worry about starting out with certain disease and pest problems from which nucs are not immune. Packages also provide an opportunity to watch the entire process of the development of a hive, from the first steps of drawing out comb and the emergence of the queen to the establishment of a mature colony, while postponing some management issues like treating for disease and dealing with swarming. On the other hand, whereas transporting bees is stressful for them whether in packages or nucs, the mailing of packages presents special problems (such as time and temperatures in transit.) Look for sources that truck the bees to you directly, or pick them up yourself. 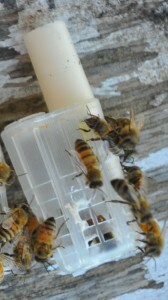 The most common problems with package bees involve the queen. For a variety of reasons, the bees will sometimes reject and kill her which can be frustrating and confusing for a new beekeeper (or even an experienced one.). The great advantage of a nuc bought from a reputable source is that it already contains a proven and accepted queen along with eggs, larvae, brood, and some food stores. However, in purchasing a nuc, the new beekeeper is purchasing a small, but fully functioning hive. That includes any pre-existing disease or parasite problems and comes with management issues similar to those of a full sized hive. Also the supply of nucs – especially local nucs – is usually limited, and those that are for sale may not be available until later in the spring. Package bees are shipped starting in April. The best way to find a reliable source, whether you are buying packages or nucs, is to ask for recommendations from beekeepers in your local association. If you don’t belong to one, join – it’s a great resource. This entry was posted in Beginning Beekeeping. Bookmark the permalink.